Attempted by Russian scientists for the first time since 1976, a touchdown onto the lunar surface would be one of the riskiest aspects of the Luna-Resurs mission. 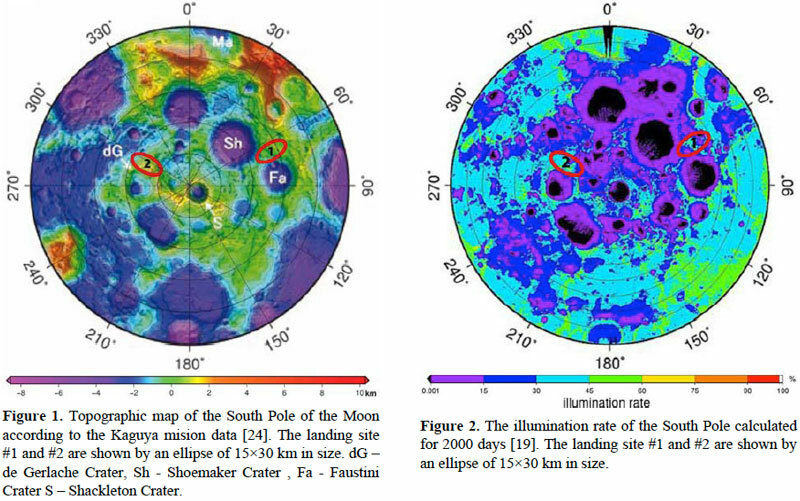 Having settled on the southern polar regions of the Moon as the primary destination of the Luna-Resurs mission, Russian scientists embarked on the difficult process of selecting its exact landing site. On Nov. 10, 2010, the Laboratory for Comparative Planetology at the Vernadsky Geochemistry Institute, GEOKhI, submitted a report to the Space Research Institute, IKI, on the preliminary search for potential landing sites for the Luna-Resurs mission. Within days, this information was also transferred to NPO Lavochkin, prime developer of the spacecraft. In a telephone interview with the editor of this web site, Aleksandr Basilevsky, the Head of Laboratory for Comparative Planetology at GEOKhI, said that information from American and Japanese spacecraft had helped in the selection of landing sites for Luna-Resurs. With the main goal of “touching” lunar water ice, Russian scientists used data from the Lunar Exploration Neutron Detector, LEND, developed by the Moscow-based Space Research Institute, IKI, and installed on the US Lunar Reconnaissance Orbiter, LRO. Developed by an IKI team, LEND helped detect vast regions on the Moon likely containing sub-surface ice. Initially, it was thought that ice deposits concentrated mostly in deep craters around polar regions of the Moon, which have not seen sunlight for eons. However, later analysis showed that at least some ice might have been buried in sunlit areas. This circumstance was crucial for the Luna-Resurs developers who had to reconcile their ambitious goals with severe technical limitations of the mission. Relying exclusively on solar power and in need of good communications with ground control, the Luna-Resurs spacecraft had to land in view of the Earth and have the Sun above the horizon. The Shternberg Astronomy Institute, GAISh, of Moscow State University, worked in parallel with GEOKhI in formulating landing site requirements for lighting and communications conditions. Thanks to data from the LEND instrument, Russian scientists identified 14 potential sites, which satisfied both conflicting criteria – being under the Sun and still hiding potential water ice close to the surface. However it was only the beginning of another arduous round of elimination of potential landing sites. “Out of these 14 sites, nine were simply scary,” Basilevsky said, “because of numerous craters and steep slopes in the areas.” Moscow-based NPO Lavochkin, the chief developer of Luna-Resurs gave mission scientists tough requirements for the approach and landing areas which could be used by the spacecraft. Essentially, a stretched circle 30 kilometers long and 15 kilometers wide around the touchdown point, had to be free of any difficult terrain for safe approach and landing. The spacecraft would use a special Doppler radar with three beams which would continually scan the surface to provide altitude information for the flight control system. 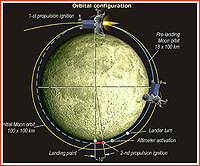 During the descent to the lunar surface, onboard computers would command the spacecraft’s main engine to burn at high thrust until it reached a hovering point above the landing site at an altitude of around two kilometers. 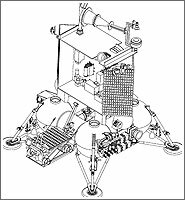 From that moment, the main engine would shut down and the lander would start a nearly free fall, interrupted only by pulses of small thrusters counteracting the low gravity of the Moon. However deep craters or high mountains could easily confuse the guiding radar beams, causing the precious vehicle to smash into the surface. 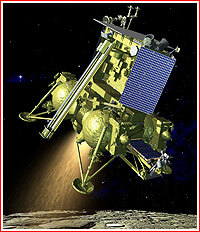 Yet, again, Russian scientists used previous lunar missions to avoid potential topographical dangers. Photos from the Japanese Selena orbiter, which entered lunar orbit in 2007, were used to assemble a complex puzzle of the potential landing regions. 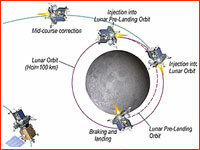 In addition, the data from the LOLA laser altimeter on NASA’s LRO orbiter was used to compile detailed profiles of the terrain over which Luna-Resurs would be approaching its landing site. To satisfy stringent landing safety requirements, only two potential sites near the South Pole of the Moon were finally selected out of the five finalists. Basilevsky stressed, however, that the current choices were very preliminary and scientists could still find themselves at square one in the selection process. NPO Lavochkin was expected to complete an addition to the preliminary design of the Luna–Resurs mission around November 2010. In January 2011, IKI planned a major international conference in Moscow, which would be dedicated to the assessment of potential landing sites on the Moon. Lavochkin is yet to release a number of critical requirements for the landing, including altitude variations below the approach path and limits on the slope angles of the landing surface. "The reason we don't have it is because they are not ready for it yet," Basilevsky said, "We did try to guess by picking as even landing sites as possible..., as our task was to launch the whole machine of the project. Later we hope to do more detailed and serious work." Basilevsky estimated that NPO Lavochkin could produce their landing requirements for the Luna-Resurs spacecraft in the first few months of 2011. "However I believe they will procrastinate with that because the Moon is close, you can fly every month and you can change everything (in the mission plan) in the last few weeks (before launch)," Basilevsky said, "In order for them to reduce the size of the ellipse or to tell what slopes are scary for them, they need to play a lot – to do some modeling and so on. Until today they had much more pressing things to worry about." The European-built landing navigation and hazard avoidance system promised to improve landing accuracy of the Luna-Resurs mission to just three kilometers. Officially known as the Precise Intelligent Landing using Onboard Technology, or PILOT for short, the system was designed to provide key information to the lander during its autonomous final descent to the Moon. The PILOT system included landing cameras, 3D-imaging "laser radar" or LIDAR for hazard detection and avoidance and a high-speed processing computer. The PILOT was developed by Airbus Defense and Space centers in Bremen, Germany, and Toulouse, France, along with other industrial partners in Europe and Canada. To test the system, a demonstrator known as PILOT-D, would be installed on the Luna-Glob lander, followed by the fully workable system flying on Luna-Resurs. With the prospects of acquiring the PILOT system, in 2013, the Russian scientists promised to re-evaluate landing sites for Luna-Resurs in the following two years. Neptec’s LEIA is being developed by a team of engineers at Neptec UK’s offices and laboratory at Harwell Campus in Oxfordshire. LEIA will be Neptec’s first LiDAR qualified for operation in high Earth orbit. LEIA will feature low mass and volume and a range of 1500 metres. It is a critical component of ESA’s autonomous landing navigation system and will be integrated with the lander. During descent there will be two re-targeting opportunities during which the LIDAR will direct a pulsed laser beam towards the surface and measure the time of flight of the reflected light. This, along with the scanning system that will compensate for the lander’s motion, will allow 3D mapping of the target landing area, even in the absence of illumination or under changing light conditions. The hazard detection and avoidance software on board will use this data to locate a suitable landing area on the South Pole of the Moon, avoiding uneven terrain and obstacles. When it is safely on the surface the PROSPECT payload will be commissioned and will collect and analyse samples on the lunar surface. According to the agency, a drill designed to penetrate from one to two meters into the lunar surface was envisaged by ESA to fly to the Moon’s south pole on Russia’s Luna-27 lander. "It is an essential part of a science and exploration package being developed to reach, extract and analyze samples from beneath the surface in the Moon’s south polar region," explains lunar exploration systems engineer Richard Fisackerly. "This region is of great interest to lunar researchers and explorers because the low angle of the Sun over the horizon leads to areas of partial or even complete shadow. These shadowed areas and permanently dark crater floors, where sunlight never reaches, are believed to hide water ice and other frozen volatiles." 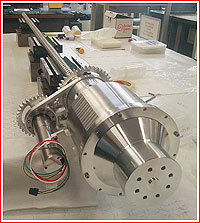 The drill would first penetrate into the frozen "regolith" and then deliver the samples to a chemical laboratory, which was being developed by the UK's Open University. The drill system plus laboratory were collectively known as Prospect for the Platform for Resource Observation and in-Situ Prospecting in support of Exploration, Commercial exploitation and Transportation. 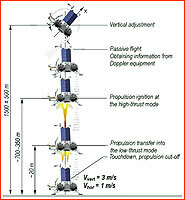 Prospect was one of the packages being developed by ESA for flight to the Moon as part of cooperation on Russia’s lunar program along with the PILOT landing system.